All transactions are safe and secure with a reliable history in online purchasing behind each of our associates. 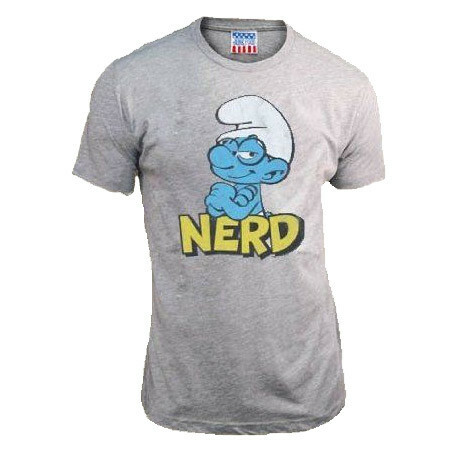 Buy the Brainy Smurf t-shirt to own Smurfs clothing and merchandise. Know which one is Brainy Smurf? He is easily distinguished by his nerdy black glasses and know it all attitude that irritates the typically pleasant Smurfs. While he thinks he is next in command behind Papa Smurf because of his intelligence, in reality he is often wrong about his facts. Get these Brainy Smurf t-shirts to show off the brains you have. Pair them with Brainy action figures. In addition to the Brainy Smurf tee above, browse the Smurfs Clothing Gallery for more apparel like men's and women's clothes, kids shirts or hoodies.